Contact Taylor’s Auto Service to learn more and apply for your credit card. Automotive care is important, and so is balancing a budget. 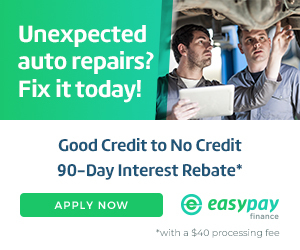 If you need financing for automotive repairs, apply for EasyPay Finance. The application process is easy, and most decisions take seconds. Whether you have good credit, bad credit, or no credit at all, you could be eligible for financing up to $5,000. To qualify, individuals must make earn at least $1,000 and have a checking account in good standing that has been open for at least 90 days. A 90-Day Interest Rebate promotion is available.